www.underclassblog.com — Simple and easy-to-use unit converter to handle any conversion you may need. With one of the largest collection of 800 units and currencies and unlimited custom conversions, it is perfect for work, engineering, school as math helper, shopping, travelling or in the kitchen. • Conversion builder to create own conversions. • 40 predefined categories with hundreds of units. • Searching across all units. • Keypad with calculator that support percentages. • Currency exchange rates from Yahoo Finance, European Central Bank and other some other banks. Requires internet connection to auto update rates. Once fetched, exchange currency rates are available in offline mode. • Simple and clear design. Supports landscape mode on all devices. • Supporting unlimited favorite conversions for quick access. • Sharing conversion results by mail. • Copy / Paste capabilities. • Display instantly the results while typing the origin value. No need to press that annoying "Calculate result" button :). On large screens the results are displayed for all units so you can monitor all of them at the same time. • Supported languages: English, German, Portuguese, Spanish, Russian, Romanian, Ukrainian. * Supported list, all with metric to imperial and imperial to metric conversions. - Basic dimension: length (distance), area, volume. 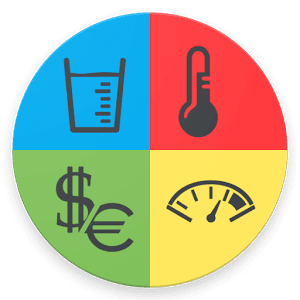 - For daily use: currency converter (European Central Bank, Yahoo, Russian Central Bank, National Bank of Ukraine), clothes and shoe sizes for men, women and children, cooking weight, fuel consumption and time. - Mechanics: pressure, weight, force, torque. - Motion: speed, acceleration, angular speed, flow rate. - Chemistry: density, dynamic and kinematic viscosity, mineralization. - Computing: data storage and data transfer. - Energy: power, temperature conversions (Celsius, Fahrenheit), consumed energy. - Electricity: electric charge, electric current, electric capacitance, electric potential, electric resistance. - Misc: magnetic field, numbers, roman numerals, fractions, astronomy distances.